Offering you a complete choice of products which include belt weigher scale. 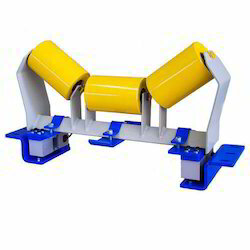 Counted amongst the leading entities of this domain, we are betrothed in offering Belt Scale and Belt Weigher Scale. The belt scale measures the rate of flow and the total quantity of material being passed over the scale in a time period. The offered scale loads being transferred to the belt, which senses by 4 high precision load cells and by an incremental optical encoder. Apart from this, clients can get the scale from us at industry leading rates. Looking for Belt Weigher Scale ?